Product #1801 | SKU 357 | 0.0 (no ratings yet) Thanks for your rating! The Manfrotto 357 Pro Quick Release Adapter adds professional quick release convenience to tripod heads that don't include one already. It gives you the freedom to remove the camera from the head and put it on any other support. 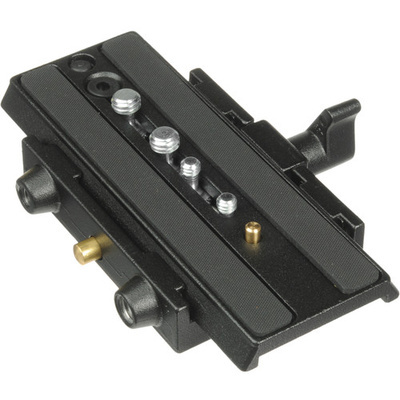 The plate features over 7.62 cm of sliding travel, and comes supplied with two 1/4"-20 and two 3/8" camera screws. In addition, it also includes a spring-loaded video pin. It's compatible with the 526 Manfrotto Pro video head.